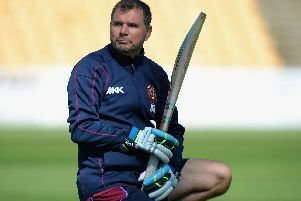 David Ripley admitted there was a hint of relief after Northamptonshire managed to end a run of 20 LV=County Championship matches without a win on Wednesday. The County stopped the rot and opened their Division Two account for the season with a convincing 92-run victory over Leicestershire at Grace Road. And having gone through the whole of last season - and the final three games of 2013 - without the chance to savour success, it was a welcome feeling for all concerned to finally close out a win. “There’s satisfaction there,” head coach Ripley said. “We haven’t won for a while and this was a tricky fixture. “A lot was said about Leicestershire before this. “So for us, having lost the toss on a very green surface, to end up winning and winning quite comfortably is very pleasing. “Even if we hadn’t won I think, as a group, we would have been quite happy with the way we’ve been playing. “I’m sure people outside the group might have said differently. The win comes on the back of an opening round draw against Gloucestershire at the County Ground. “The most satisfying thing about the two games we’ve played so far is that we have been on the ropes at times,” added Ripley. “We’ve lost the toss in both and have been second favourites at various stages. “But there has been resilience, fight, competitiveness - call it what you want. “We have played consistent cricket and won against the odds. “At the start of 2013 we steamrollered some sides and that set us going. “It’s been different this year as we’ve had to work hard.